The cornerstone of the Dutch healthcare system is the general practitioner (GP), who serves as the entrance to the health system. There are 8,500 GPs in the country and the density does not vary that much between regions. Most have about 2,300 patients, 99% of the population is registered with a GP, and there is free choice of GP. The GP acts as gatekeeper to the healthcare system, with referrals required for specialist and hospital care. 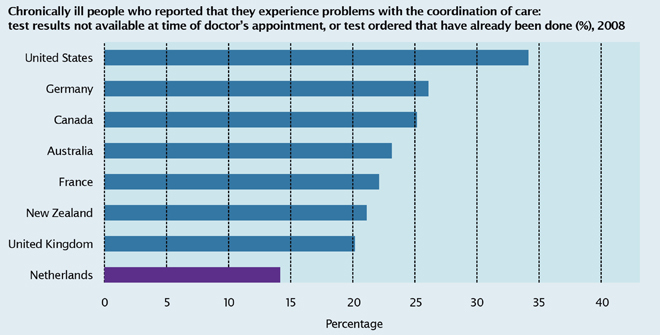 GPs are effective and efficient, handling about 96% of all contacts themselves; only 2.5% are referred to hospitals. The number of avoidable hospitalizations for diseases such as asthma, chronic obstructive pulmonary disease (COPD) or heart failure is low by international standards. Dutch GPs are longstanding users of clinical practice guidelines and most prescribe and treat according to those guidelines, although there is substantial variation. The public is very satisfied with the timeliness and access to care, with 90% of people polled stating their satisfaction with the timeliness of acute care, including care by GPs and in the emergency room (ER). 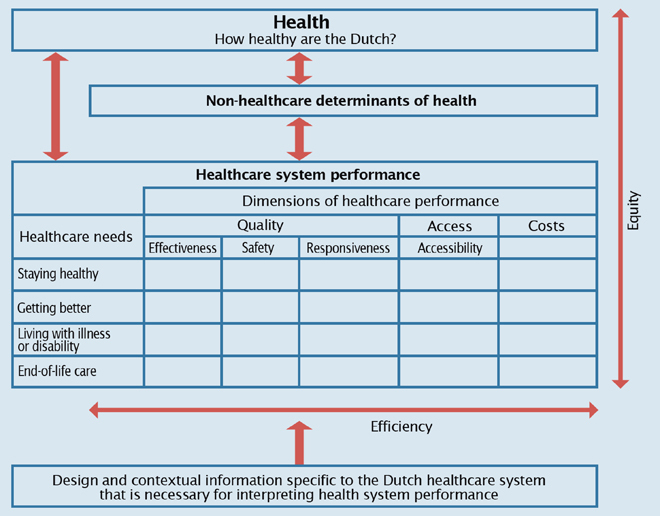 The Netherlands has a very low healthcare utilization when compared to other countries. Because use is already so low, when reforms started, the research community in the Netherlands advised government not to invest in ways of dissuading people from using health care, such as co-payments or other restrictions on access to the health system. The context for our reforms dates back to the late 1980s, when an expert committee led by Wisse Dekker, a former CEO at Philipps, highlighted the low efficiency of the health sector and the need for greater innovation. That report was a landmark in our discussion about reforms, though it took 20 years to finally bring a set of reforms in that direction through Parliament. In 2004, building up to reforms, the Dutch Ministry of Health stated that the performance potential of the healthcare system could be substantially boosted if centralized state control made room for a decentralized system of regulated or “managed” competition, a term borrowed from the economist Alain Enthoven. Prior to reforms, people above a certain income level (about 35% of the population) had to buy their insurance privately, while the rest of the population had social health insurance. The 2006 New Health Insurance Act changed that, requiring that all Dutch citizens over age 18 buy private insurance and receive a government-defined comprehensive health insurance plan. Supplementary insurance can be purchased from an insurance company, but it is not needed and does not cover very much. Insurers are legally required to accept all applicants but can critically purchase services from providers. It was hoped that this would prompt providers to compete on access, quality and cost. The government takes a back seat in this process, exercising less “controlitis” and central planning. This is meant to encourage disruptive innovation, system responsiveness and patient-centred care. Dutch individuals pay 100 euros a month as a health premium (with government compensation for low-income people), with employers adding another 100 euros for each employed person. The government pays that amount for people who are unemployed. This money is pooled in a big fund and is given to the insurance companies with a risk equalization formula that tailors compensation to the different populations covered. 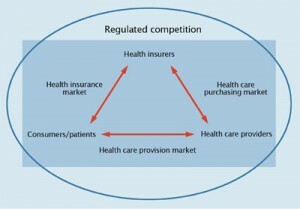 Figure 1 presents the regulated competition model. The circle around the elements represents the fact that all activities take place within a regulated environment. Within that are three markets: the health insurance market, the healthcare purchasing market, and the healthcare provision market. The reforms have not involved any budget cuts so far. In 2006, Parliament insisted that before reforms were implemented, the Health Minister had to ensure that two things were in place: a website for the public that would help them get information about care providers and decide where to go for care; and an independent report on the performance of the system. The Minister asked the Institute of Public Health to provide an independent coherent analysis of the performance of health care at a system level, focused on three goals: quality, access and cost. Provider and patient perspectives had to be represented, along with time trend data and international comparisons. The report was to look at a limited set of indicators and special themes, including efficiency and the impact of system change. The first step was to create a healthcare system performance framework, and distinguish indicators of the health of the population (which is the subject of a separate report) from indicators of the health of the health system, which was what we were aiming to measure. We worked on the framework with the OECD in Paris (Figure 2), adopting the four healthcare needs identified by the Institute of Medicine: staying healthy, getting better, living with illness or disability and end-of-life care, and looking at each from the three dimensions of quality, access and cost. The production of the report entails filling in the cells in the bottom section with valid indicators. We ended up choosing 125 indicators that were susceptible to change, could be linked to health policies and would enable us to paint the big picture. Indicators that can be compared internationally attract government attention and were prioritized. Each report includes a chapter on what needs to be done to improve the report, as this sets the research agenda for the years ahead and provides continuity in our work. Inviting the Minister of Health to write the Foreword for the report is an effective way of gaining some commitment from the Minister to respond to its findings. The third Health Care Performance Report was released in 2010. It found that costs are increasing at a pace similar to other European countries, accessibility is a strong point and quality is not always up to par. It looked at care coordination, healthcare vacancies that are difficult to fill, spending, wait times, avoidable mortality, variation in the prices for certain procedures across hospitals and shared decision-making, among other indicators. Whenever possible, performance in The Netherlands was compared to that of other countries. Figure 3 shows comparative success in coordinating care. The findings are helpful in highlighting areas where the reforms are not producing the desired results. For example, Figure 4 shows that there is still significant price variation between hospitals for given procedures. If you introduce competition and have insurers critically purchasing these services, you would expect that the variability in prices would go down in a short period of time. That is not yet the case in The Netherlands. A number of indicators in the report show quality variations within the country. Prescription guidelines are followed by GPs between 49% and 77% of the time, and medication errors, wound infections and hospital-standardized mortality rates vary quite a lot between hospitals. Unplanned cesarean sections range between hospitals from 7% to 30%, and many of the highest rates are in smaller non-teaching hospitals. It is obvious that medical practice variation needs more attention in The Netherlands and it is now very high on the agenda. The variation observed in quality will be the focus of the next report. The Report is meant to help assess whether reforms bring the desired results. Public opinion polls in The Netherlands show no change in public satisfaction with the system before and after 2006. After five years of regulated competition, what we see is a fierce competition between insurance companies, many mergers, and the public benefitting from a 2% reduction in premiums, with no indication of risk selection by insurers. Insurance companies have therefore lost money. The risk-bearing by insurance companies is not very large and the persistent variation in prices would indicate that they are not producing the competition on price that was expected; they know they will be compensated after the fact. There is now talk of increasing the risk for insurance companies. Insurers have not competed very fiercely on quality. Transparent quality information to inform public choice is very difficult to produce and requires the involvement of providers. Putting that in place takes about 10 years. Web sites like the one pictured above enable patients to rate their provider and care. Recently, we have also seen insurers publicizing in the papers that they will not contract with certain hospitals for breast cancer care because they have low quality scores. The new Liberal Dutch government recently brought up the issue of co-payments and is also discussing the content of the basic benefit package, which is politically risky to tamper with. There are plans to concentrate high-tech care and introduce a new financing mechanism for hospitals based on disease-related groups (DRGs) and completely focused on performance and results. Changing from a centrally planned healthcare system with very rigid rules for all things to a functional healthcare market is difficult and takes time. But even with strong regulation, providers and insurers gain more and more room to negotiate with each year. For instance, 75% of all procedures within the hospital are now freely negotiable with the insurance companies, up from 10% in 2006. But stakeholders need to get used to it and invest in information gathering to get the best value for money. With GDP growing more slowly and the euro weak, there is increasing pressure on the cost side and a temptation for government to step in. However, the current Health Minister has said that she will give the healthcare market time to get used to its role and let the market work. If the Minister jumps in, other stakeholders will step back. 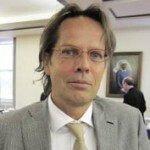 Gert Westert is Professor of Health Services Research/Quality of Health Care at the Radboud University Nijmegen Medical Centre, Director of IQ Healthcare and Professor of Health Services Research at Tilburg University in The Netherlands. IQ Healthcare is one of the leading scientific institutes in the field of research, education and support of quality, safety and innovation in health care in Europe. Dr. Westert was co-editor of the Dutch health care performance reports 2006, 2008, 2010 at the National Institute for Public Health and the Environment. He is a member of the editorial boards of the International Journal for Quality in Health Care and BMC Health Services Research. Prof. Westert is also editor of Morbidity, performance and quality in primary care (Oxford/Seattle: Radcliffe, 2006) and co-author of three textbooks in the fields of public health, health services research and health economics.